Actually it should be about me, rather than about us. 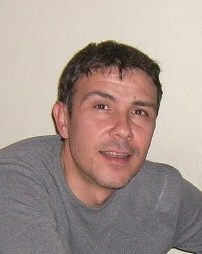 Because we are a small company and I, Levent Orbay (Mr.) is the person who made this web site and organizes everything. In addition to that when you contact us your will directly communicate with me. As long as I make all the arrangements for our Budapest, Vienna and Prague tours and I accompany to our customers during the tour, when you contact us you will get %100 true answers. My story is simple. Getting married with a Czech girl brought me to Prague. Since 21 years of age I am working in travel business, I easily adapted beautiful Prague. One day, one of friend from New York who we met in US when I was working as an au-pair in New Jersey; she told me to make private tours in central Europe, especially Prague, Vienna and Budapest. Since I was making this roundtrip for groups of other agents, the idea was great to me. As long as I knew all the costs, I could make it a lot cheaper than all big travel agents and also in private. I even included the optional tour that all agents are asking additional money for it. All I needed the marketing, but I couldn’t effort to advertize like big companies. So one customer to another slowly here I am. Please feel free to contact me, I will be glad to organize Prague, Vienna and Budapest roundtrip for you. You can even add Berlin, Salzburg (Mozart’s birth city), Nurnberg and Munich to your roundtrip. We are a full-service travel retailer. The biggest advantage of traveling with us is that we’re not like any other travel retailers who are selling the escorted package tours of any other travel agents or organize own escorted groups. We offer much more than just the roundtrip. We offer privacy; we offer real value with the flexibility and features our travelers want. We are specialized in Central Europe for Budapest, Vienna and Prague tours. And also we are organizing this tour %100 in private for our clients. Our tours depart with minimum with 4 or 6 persons depending on the hotel selections of our customers. Our company founded in Prague in 2002. Since we are in an age of technology, we organize all our bookings via internet; we closed our city office and moved it to home office. All those lowered our costs, so now we can offer our customers the best prices and travel privately, instead of an escorted group. Apart from travelling privately we included US$ 922 worth optional tours in our program. What would you say I can arrange much cheaper roundtrip for you? Please kindly see Compare Our Prices in our homepage.